A study that has just been published in the online journal Neurology indicates that people suffering from type 2 diabetes also demonstrate a drop in cognitive skills as well as the ability to regulate their blood flow to their brain. This is due partly to inflammation, which is one of type 2 diabetes’ common components. Normally, blood is distributed by the brain as needed to areas where there is increased neural activity, In people that suffer from diabetes however, that process can become impaired. For the recently published study, researchers recruited 65 males and females whose average age was 66, of which half had type 2 diabetes and half did not. The study’s participants received a series of cognitive and memory tests at the start of the study and again 24 months later. They were also given brain scans that measured the blood flow and volume in the brain and blood tests that measured blood sugar and inflammation. After the 24 months, people who were diabetic showed greater declines in their gray matter and impairments in the ability to regulate the flow of blood to the brain than did people who were not diabetic. The regulation of blood flow fell by 65% on average in those participants who had diabetes. 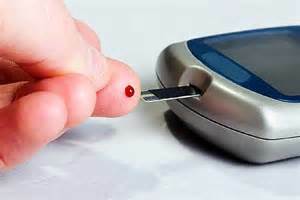 Amongst the participants suffering from diabetes, scores for memory and thinking tests dropped on average by 12%, while test scores for those without diabetes remained the same. Higher inflammation levels were correlated with a greater difficulty in regulation of blood flow. Those with impairment of blood flow regulation that was the highest during the outset of this study had more problems performing daily activities such as bathing and cooking following the 24-month period of the study. This study is just the latest that has observed a link between cognitive decline and diabetes. With a growing amount of evidence shown through research of an association between neuro-degeneration and insulin resistance, some researchers are calling Alzheimer’s Disease the new diabetes.